While re-reading Jeffrey Pfeffer’s (1992) Managing with Power, I was struck by Pfeffer’s linking of power to brute physical endurance. By endurance, Pfeffer doesn’t mean the ability to benchpress more than one’s weight, but the ability to not step out from a meeting for a bathroom break* or the ability to work long hours on limited sleep. Although some strategic readers might opt to strengthen their bladders or invest in astronaut diapers to avoid missing an important part of a meeting, perhaps we should ask a deeper question about whether such stamina is warranted. When I first started observing Burning Man senior staff meetings, decision making consisted of arduous, drawn-out affairs. One 45 minute-long discussion about a proposed $500 budget item for camels almost sent me, the observer, into a comatose state beneath the conference table. Because the senior staff used decision making by consensus in which all participants were supposed to agree on matters (as opposed to voting), discussion could generate wild swings. Some participants felt blind-sided by the topics brought up for discussion. Other participants experienced the gamut of undesirable outcomes: upsetting conflicts, hurt feelings, agreement out of sheer exhaustion, and a dread of future meetings. Over time, organizers learned to initiate informal discussions ahead of meetings so that people were prepared for decision making. Thus, organizers introduced enough structure to encourage decision making moments, rather than subjecting everyone to physical endurance trials. * Among academics, those who leave risk getting assigned to committee work. What to do about dying or failing organizations? The past year has been a particularly eventful, if not unnerving, year for understanding the “life cycle” of organizations. Researchers argue that new organizations suffer from the “liability of newness” problem. * They lack sufficient infrastructure, legitimacy, and resources, and they are thus vulnerable to threats from regulators, competitors, and suppliers that can lead to organizational closure. The Burning Man organization has, at various points, faced such threats. With a combination of luck and support, it has survived its early years. However, even well-established organizations may be unable to surmount problems. Some organizations die “quickly.” The collapse of a key banking and investment organization Bear Stearns over one weekend, and the subsequent frenzy of survival-oriented activity in other similar firms in the ensuing weeks as confidence weakened, took most people by surprise. Other organizations fail “slowly.” State intervention (i.e., the on-going General Motors bail-out) may prolong these organizations’ survival. Without such state activity, various large airline firms, railroad companies, and car manufacturers would have died years ago. Competition from other organizations may accelerate decline. Such a selection process is evident in the disappearance of local independent bookstores. ** In my old neighborhood, several independent bookstores folded over the course of a decade, leaving only one, my favorite (the Harvard Bookstore) standing. In my current neighborhood, with the recent closure of an independent bookstore, only two independents, Book Culture and Bank Street Books, remain. Large online firms don’t bear the high cost of storefront rent, and they have more muscle to negotiate with publishers. With these advantages, online firms have usurped independents. Independents that have managed to hang on (so far, at least) often rely upon a unique identity and appeal to attract supporters. Given Burning Man’s “unique” output of a week-long arts community, it’s difficult to imagine how competitors can edge Burning Man out. More commonly, organizations that do survive their early and mid years face a succession and growth challenge. As original founders retire or are forced out, remaining members and new members may falter. As the organization grows in size, remaining members may miss the intimacy of the original organization, and newcomers may wonder what is so attractive or distinctive about their organization. One of the ways in which Burning Man organizers has addressed these challenges of succession and growth is to encourage members to set up their own local organizations and events. Through regionals and local events, supporters can find a more intimate, year-round community, rather than waiting for Labor Day weekend. Although the Burning Man event and organization may someday end, it’s likely that other events and communities will continue to embody the Burning Man ethos. * Arthur L. Stinchcombe. 1965. “Social Structure and Organizations.” Pp. 142-193 in Handbook of Organizations, editted by James g. March. Chicago: Rand McNally. ** For more on independent bookstores, see Laura J. Miller’s (2006) Reluctant Capitalists: Bookselling and the Culture of Consumption. Chicago, IL: University of Chicago Press. Organizations that have moderate to high turn-over among its members, such as McDonalds and other low-wage workplaces and voluntary associations, face a challenge. They must pass down knowledge that often is taken-for-granted (e.g., tacit memory about the correct sequence of, say, placing hamburgers on a grill or the proper steps for pulling together a meeting) to new members. Typically, organizations use routines, orientations and trainings, handbooks, and record-keeping to orient and acclimate new members. But what happens if these structures are not in place? The lack of such structures may be symptomatic of under-organizing’s insufficient structure or coordination. For the Burning Man organization, such underorganizing was glaringly evident when key persons departed suddenly, forcing remaining and new members to re-establish departments from scratch. 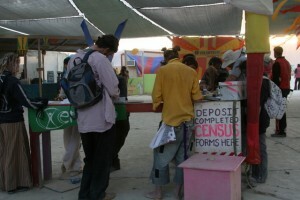 For instance, operations for the Gate, or the entrance to the Burning Man event, had to be recreated after a key leader left without leaving records of how to run the collection of tickets. At one point, I realized that as a researcher who had observed organizing activities over the years, I was a source of tacit organizational memory for others. I was the one who reminded a volunteer manager that pamphlets had to go to the Gate for distribution to incoming participants; at times, I shared a version of my field notes for those who wanted a record of meeting activities. In subsequent years, Burning Man organizers have introduced ways of sharing knowledge among members via volunteer mixers, departmental handbooks, record-keeping, and teamwork. These changes have since smoothed over transitions as members depart or join. Undoubtedly, not all knowledge passes down, which suggests the potential for re-invention or innovation. These are terms used in my blog and book. Most of these terms are commonly used among Burners. When I first started studying the Burning Man organization back in 1998, the organizers worked from their apartments. For meetings, they borrowed office space, such as Joegh Bullock’s Anon Salon/Climate Theater down in SOMA, San Francisco. The next year, organizers rented a small office space at 3450 Third St., an unassuming building with white tile and blue trim, which they furnished with scavenged furniture. This move allowed organizers to establish everyday operations and routines, as well as host meetings for volunteers. I have fond memories of taking field notes on meetings and other activities while perched at a repurposed dining table supported by a stack of buckets! After the dot-com bust eroded the once-white-hot commercial space rental rates (sound familar? ), organizers signed a lease on a larger office space at Third and 16th streets, where their headquarters is currently located. This lease will expire by the end of this month, and their building will be torn down under the University of California at San Francisco’s redevelopment plan. The Jack Rabbit Speaks newsletter reports that the Burning Man organization will move some operations into a temporary space while some will telecommute from home. It would be interesting to see how this move might affect their organization. (1) If you accept (or are forced to accept) funds from the government, be prepared to kowtow to conflicting demands and face intensive grillings by ill-prepared politicians. (2) If you want to maintain your legitimacy as an organization, be prepared to deal with the media. The media plays a crucial role in framing issues and making issues more or less salient. For instance, why has recent media coverage focused on the $165 million in bonuses that AIG paid out, as opposed to other alternative stories about how our taxes are allocated, such as the $515 BILLION used for military spending? Or how an estimated $1 BILLION in governmental subsidies help ensure that Wal-Mart earns $12.8 BILLION in profit while its workers do not have a living wage or health care? A deluge of volunteers…What to do? In the past two days, both the NYTimes and Wall St. Journal have reported that with the recent massive layoffs, a deluge of highly skilled volunteers are now available to help non-profits and voluntary associations. How can organizations best integrate these new volunteers and tap their talents, while meeting volunteers’ interests? My studies of the Burning Man organization revealed that this organization excelled at tapping volunteers’ interests and (lack of) skills. Rather than being pigeonholed into certain tasks, volunteers could develop their own roles, and they also develop skills. Some volunteers spearheaded projects, such a recycling center, a question and answer service, and a message service, that became part of the organizational infrastructure.